UKSSSC LT Results 2018 : Uttarakhand Subordinate Service Selection Commission (UKSSSC) has announced the LT Assistant Teacher results on its official portal, sssc.uk.gov.in. The competitors attended the UK LT Assistant teacher examination on 21st January can proceed to check the results. The results were actually expected to release in the month of April and the organization has slightly delayed in declaring the results and announced the results on 31st May finally. The UKSSSC has also released the cutoff marks of LT Assistant Teacher examination. Candidates can check the cutoff marks, and answer key of LT Assistant teacher examination. The authority has also unveiled the UK LT assistant teacher merit list of selected aspirants. Competitors who have been waiting for a long time to download the results can check results, merit list, and cutoff marks by visiting the UKSSC official website, ssc.uk.gov.in. Or from the Uttarakhand Technical Education Board’s official website, ubter.in. Uttarakhand LT Results 2018: Uttarakhand Subordinate Service Selection Commission (UKSSSC) has announced 1214 Assistant Teacher (LT) posts in the first quarter of the year. The UKSSSC board has accepted applications from the interested and eligible aspirants during the application dates. 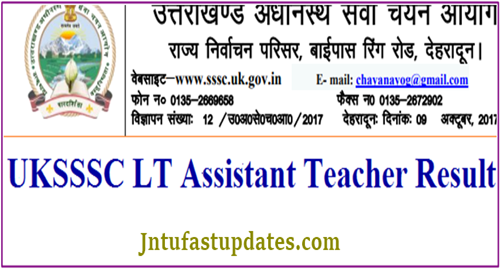 A large number of hopefuls have applied the UKSSSC LT Assistant Teacher posts this year. The screening of the candidates for the announced posts will be purely done based on the merit obtained by the aspirants. Candidates clearing the written test round will be shortlisted for the interview round. Finally, candidates clearing the interview round will get jobs as an assistant teacher in the state of Uttarakhand. Aspirants can get LT posts in various government, private, and aided schools in Uttarakhand. The UKSSSC has conducted the Assistant Teacher (LT)/Sahayak Adhyapak examination in various subjects. Aspirants have applied for various subjects such as Hindi, English, Sanskrit, Maths, Music, Social, Science, and in many other subjects. Aspirants have massively competed for each subject. The UKSSSC has organized examination for each subject individually. Hopefuls seeking to become Sahayak Adhyapak in the state of Uttarakhand have to qualify the test with good merit. Check UKSSC LT Resuts for Maths, Urdu, Sanskrit, Hindi, Science, English, Music, Home Science, Arts From below. The UKSSSC has already released the UKSSSC LT Cutoff marks /qualifying marks on its official website, ssc.uk.gov.in. aspirants scoring the minimum cutoff marks section-wise, category-wise, and overall are said to be qualified in the test. Qualified candidates will get the chance to participate in next round, interview. The organization has already listed the UK LT/Assistant teacher merit list 2018 with the names of qualified aspirants. Candidates cleared the test can check their names in the merit list. Merit list candidates will be sent to the interview round. And the candidates clearing the interview round with good merit will be getting jobs as an Assistant Teacher in the state of Uttarakhand. Initially, visit the Official UKSSSC Website i.e. sssc.uk.gov.in. Now, go to the “Exam Results” section. Now Search & Click on the “Uttarakhand LT Results 2018“. Enter the required details such as your Roll No. & Click on the “Submit” button. Download UKSSSC Assistant Teacher Result 2018 Name Wise and check the marks. Can you tell me how to check my marks? I am unavailable to check my marks. I am not selected for the same but I want to know my marks. if you have any suggestions then please let me know.